I’m not entirely sure where to begin when it comes to Beautiful Disaster. There were things I thoroughly disliked about this book and certain things I found entirely compelling, ultimately leaving me to struggle with my review. I compare reading this book to something akin to ‘rubbernecking.’ You know, when you see an accident and etiquette determines that you shouldn’t look, but human nature won’t have you look anywhere else? I thought I should put it down and stop reading… but I couldn’t bring myself to look away. 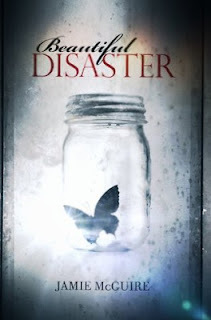 I completely understand why readers have such a love/hate relationship with this book, and it really comes down to the reader as to which category they will choose to place Beautiful Disaster in. I get the draw that fans have to Travis Maddox, and I have friends who think he’s downright dreamy, but let’s be honest here: The boy has issues. Definite issues. But at least he doesn’t pretend to be anything other than Travis.. I like that he’s upfront and a take-me-as-I-am kind of guy. Now, Abby is a different story. For me, she was the ultimate disaster. She was pretending to be someone she was not, and my biggest complaint about her character is what she put Travis through. If you care for someone who suffers from the problems that Travis does, why would you put him on such an emotional roller coaster? Abby inflicts more damage on Travis than his fighting matches ever did. And that friend of hers? Please. I’ve had my share of vacillating and temperamental friends, but America takes the cake. The writing contained errors and inconsistencies, but the story did hold my interest and, at times, became quite absorbing. Then there were things being thrown my way that were very distracting and didn’t flow within the story as they should: a puppy, a fire, a trip to Vegas… oh my! My biggest concern with Beautiful Disaster is that an impressionable teen will romanticize the obsessive/possessive relationship shared by Travis and Abby. Being stalked is not romantic. Co-dependency is not beautiful - it’s simply a disaster. A controlling, irrational disaster. Even in the midst of all I found disagreeable in the story, Travis stayed on my mind longer than I would have liked. While I don’t have plans to read Walking Disaster (from his POV), I do have a morbid curiosity to his innermost thoughts. The problem is I’ve had enough of Abby to last me a lifetime. Hmm, I've read so many polarizing opinions and I honestly still don't know what to think. I doubt this is a Maja book, but then there are some people I trust who really liked it and some people I trust who really hated it. The obsessive/possessive relationship is probably more than I can handle. Oh rubbernecking is a brilliant way to describe reading this book. I agree that some parts where difficult to turn away from, even when it was probably best to. I had strongly mixed feelings about this book and gave it 2.5 stars in the end, but I do understand why some people may be able to look past the faults and focus on the compulsively readable parts. I loved your review because it's so refreshing and honest about a book that has taken off like a rocket in terms of popularity. I finally just read this book, too. And, my first status update on Goodreads went like this: "hmmm...I'm holding my breath because this disaster up ahead is pretty easy to see...not good." These are not the worst/questionable/unsavory characters with the biggest problems I've ever come across (Poughkeepsie comes to mind). My "problem" with Beautiful Disaster was that the characters did not really change enough. The conflicts between them were really quite manageable, so the problems, from a literary sense, that arise within the story are not believable enough and the tension between these two is diminished in some ways. The misunderstandings and misrepresentations, especially Abby's, even for a freshman in college, seemed immature and contrived. Travis never pretended to be more than he was; and, in fact, he did most of the changing at one point "for her" and she completely missed it. Disappointing in some ways because the story was so good on so many levels. When I read this book, Neyerda from Mostly YA Obsessed said that it is one of those books you either love or hate, and I totally agree and understand where you are coming for. I fell into the I really loved it category, though I do agree with your concerns for impressionable teens and so appreciate your honest review. I am dying to read Walking Disaster and get into Travis' head. It will be interesting to see how that turns out. My friends swear I will love this book. I have a feeling, barring a miracle, that I will feel the same way as you. We'll see. Great review!